John Barker reads from his new novel and discusses the role of political fiction. John Barker served time for his political activities in the 1970s, described in his prison memoirs Bending the Bars. 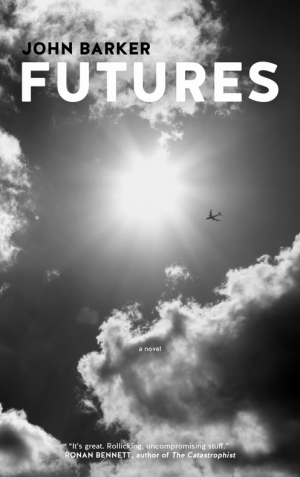 With his new hard-boiled novel Futures, set in the cynical money-hungry world of Thatcher’s London, Barker asks whether fiction can be more immediate and effective than non-fiction in raising political issues. Join the day of action to raise public awareness of TTIP, Transantlantic Trade & Investment Partnership, the secret US-EU deal being hatched which will give multinationals power over sovereign governments. They will be able to sue governments that make decisions against their interests, e.g. US pharma giant Eli Lilly is currently suing the Canadian government for $500m for trying to stop using their drugs. More details online from 38 Degrees. Saturday 18th October (Same day as London Anarchist Bookfair) National ‘Britain needs a pay rise’ demo in London organised by TUC. Meeting of the 1912 Bridport Wildcats project Planning for a re-enacted costume photograph and commemorative bench for the women wildcat strikers of 1912. Come and put your name down if you want to take part in the event in February. Music, singing, and performance of locally-produced cartoon play about the NHS and privatization.